You might remember Keyroad, a stationery shop on Shanghai’s FuZhou road, from the blog post about the Simbalion Graphic Pencils or from the blog post about the Deli pencil sharpener 0635. How could I not go there again this year… This time I was actually more excited by two other shops on FuZhou road, but I will not go into more detail now and will write more about them another time. Back to Keyroad. I bought several packs of pencils, including a few different types of wooden pencils made by M&G, a stationery manufacturer from Shanghai which I only knew as a manufacturer of mechanical pencils and other stationery, but whose wooden pencils I have either never seen or I must have forgotten about. 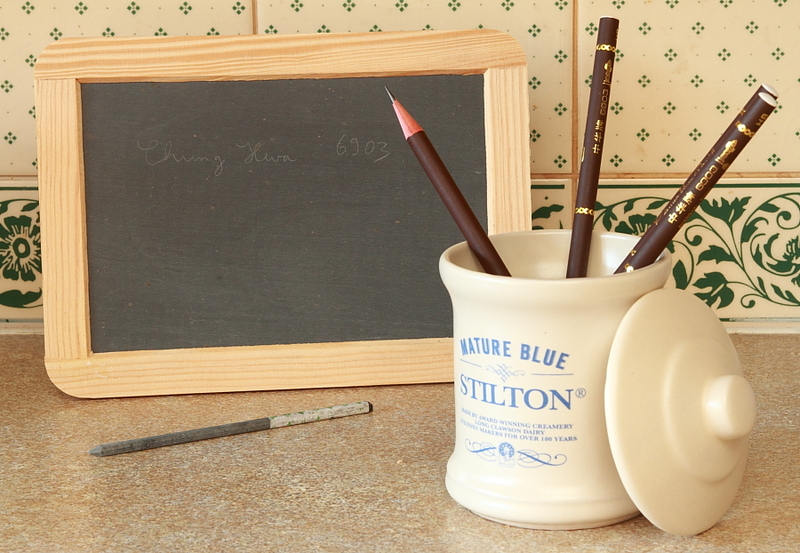 The best looking pencil in the shop was, however, the Chung Hwa 6903. A round, brown pencil with a white-painted cap and golden lettering. What a magnificent looking pencil, at least in my (subjective) opinion. I am not really a fan of round pencils and prefer hexagonal pencils, probably because I don’t have to write using pencils for six hours in one go… Nevertheless, the elegant look of this pencil, the great combination of colours used, the lettering and, not so common for a Chinese pencil, the painted cap made this pencil the star of the shelf. There was some disappointment when I sharpened the first 6903 a few days later, the cheapish looking red wood does take some of the magic of the pencil away. There are also some gold flecks on the pencil body near the lettering and the white cap could have been painted a bit better. The 6903 seems to have a slightly larger diameter than some other round pencils, like the Faber-Castell 9008, but compared to the 9008 the difference is less than 1mm. Keeping in mind that this is not an expensive pencil, I paid ¥9.9 (~ £1; $1.55; €1.25) for a dozen, the 6903 provides excellent value for money. The graphite transfer between pages for text written with a 6903 HB is similar to the transfer that is occuring with a Staedtler Mars Lumograph HB, definitely worse than a Staedtler Wopex HB and definitely better than a Tombow Mono 100 HB. If you have a chance to get the Chung Hwa 6903 for a good price you should definitely give it a go. I am quite happy with these pencils, but wish there was a better version, made of cedar wood, or at least something not so red. I’d be more than happy to pay extra for the better material. The Chung Hwa Drawing Pencil 101 has been reviewed in a previous blog post. These are good looking indeed. I wonder what kind of customers they are targeted for. Don’t how much common writing pencils cost in China nowadays, but 10 RMB for a pack sounds a bit high for local school and university students. I’d imagine one can easily find Chinese brandname pencils for 5 RMB a dozen. memm, what’s your impression? 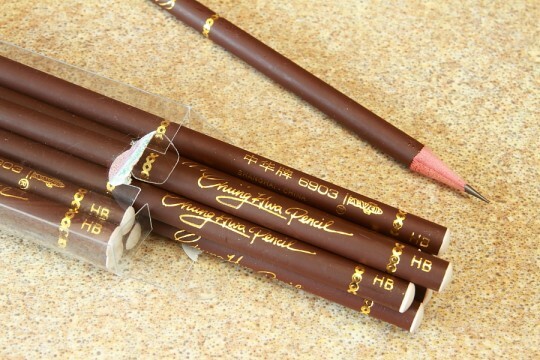 You are absolutely right that it’s very easy to pick up cheaper brand name pencils, which many students will go for..
I’ll have to review one of the Chung Hwa 6903s you sent me…I was very interested to find a round pencil in the package (for which I send you many thanks – everything was intact BTW). It looks classy, but after reading your review, it does underline the point that looks aren’t everything. In case you got the pencil before you saw the blog post: what were your first ideas when you saw the 6903? Did you think it’s very good looking, too? Yes, I do think it looks good. I’ve written a bit with it already, and so far it’s been better than I feared: nice dark lead, and fairly smooth. OK, not smooth like a Staedtler 4B or even a Blackwing, but no nail, either. I’d keep these in my pencil cup for the looks, if nothing else. A very nice looking pencil.